Food news in RVA is devoured as voraciously as celebrity gossip in Hollywood. So when word hit that Mike Isabella would be headed our way, knees collectively weakened. Food news in Richmond is devoured as voraciously as celebrity gossip in Hollywood and political chatter in DC, so when Richmond’s collective ears perked to the word that Mike Isabella would be joining #RVAdine, hearts skipped their beats and knees weakened. It was enough simply to know that he’d be joining our own nationally acclaimed chefs; and then came the news that partners Travis Croxton and Hilda Staples of Rappahannock renown were part of the equation, and heads pretty much exploded. Just as relevant as the fact that Isabella has been on two iterations of Top Chef is what got him there in the first place, the unique stamp Mike Isabella puts on everything he creates: a signature that marries history and tradition with a sense of humor and warmth. In his book, Crazy Good Italian, Isabella devotes an entire section to “Jersey Shore style: everything fried.” Jersey food is as much of a contributor to Isabella’s ethos as anything else, and it shows. If Snooki were a pizza, she’d be Isabella’s Jersey Shore: the gratuitousness of fried calamari on a pizza, drizzled with a fiery cherry pepper aioli that happens to be the hue of Snooki’s signature skintone. At first you’re like “that sounds obnoxious,” and then you’re all, “it’s actually rather charming,” and eventually, you’re doing the walk of shame holding an empty pizza box, aioli smeared on your lips. But if the Jersey Shore pizza is Snooki, the Countryman is a young Frank Sinatra–a suave egg jiggling delicately over a handsome chaise lounge of fontina and black truffle. Notes of New Jersey are all over Isabella’s menus, including a housemade “Taylor Spam,” a take on the beloved pork roll from the North, which finds trippy bedfellows in pineapple, sriracha, and ramps on the Pineapple Express pie. Isabella pays one last, sweet homage to his home state with zeppole–airy, powdered-sugar-dusted balls of fried dough, served with a fluffy cloud of salted toffee cream. “Because it’s not a walk down the boardwalk without zeppole in your hand.” In his book, Isabella paints an amusingly vivid picture of himself as a be-mulleted youth, rocking a Motly Crue t-shirt and gobbling zeppole from a brown paper bag, the same way he serves them at his restaurant. During a tasting at Graffiato DC, Isabella is behind the line, presenting plate after plate of dishes intended for Graffiato Richmond, when suddenly he senses something off with service. He makes a brief utterance to the cooks, a sharp snap, barely audible over the din of the Saturday crowd, but to them it’s like a dog whistle that they each hear and respond to with nearly imperceptible speed. It’s an unintentional show for the guests, an upfront view of the magic choreography that churns out polished plates of food from a roaring 900-degree fire. It also responds to the desire of the guests to see “The Chef” in action and encourages discussion, even when there isn’t time for it. An open kitchen can be a blessing. Tucked away from the gaze of humans in a florescent dungeon of printing chits and barking expeditors, cooks can easily become disconnected from the guests and the experience they’re contributing to in the dining room. For better or worse, an open kitchen puts the reality there for all to see, for both the cooks and the guests. Isabella has open kitchens, specifically designed to encourage a connection between diners and chefs, in all of his restaurants, and Graffiato RVA will be no exception. The open kitchen plan will feature a U-shaped bar where guests can watch pizzas flying in and out of the wood-fired double oven. At both Kapnos and Graffiato DC, Isabella finds innovative ways to sling drinks, including the small batch lemonades and punches found on the specials menu. Graffiato’s new home in what is now Popkin Tavern comes equipped with two dozen taps. “I didn’t want to put in 24 beers because that’s not me, so we’re doing wine, prosecco…” Isabella explains. Graffiato DC features both housemade sodas, including Rhubarb and Vanilla and Cardomom Cream, as well as cocktails on tap, an emerging trend in the industry that allows Isabella to feature a selection of barrel-aged cocktails, including a Negroni using damrak gin, campari, carpano–from a tap. The beverage program at Graffiato also includes Graffiato-specific spirits, including the Jefferson Graffiato-label bourbon used in Isabella’s favorite cocktail, Empire State of Mind, alongside ramazzotti amaro and Fernet Branca. If a signature bourbon isn’t enough for you people, there’s Graffiato’s own Nebbiolo blend, created at Breaux Vineyards in Purceville, VA; it’s a full-bodied red with notes of tar and violet and a full, floral, tannin-y finish. It’s some deep drinkin. The food at Graffiato is a direct product of Isabella’s education and career, as well as his family and upbringing. Without Mike Isabella’s unique personality, these dishes don’t exist. Handcut spaghetti and red sauce is about as traditional as it gets, and by all appearances the Graffiato incarnation tows the line. But it doesn’t. Isabella uses Thai basil instead of Italian basil because he prefers the sweet, slightly anisette taste, and in a recipe with few ingredients, it leaves a lasting impression. 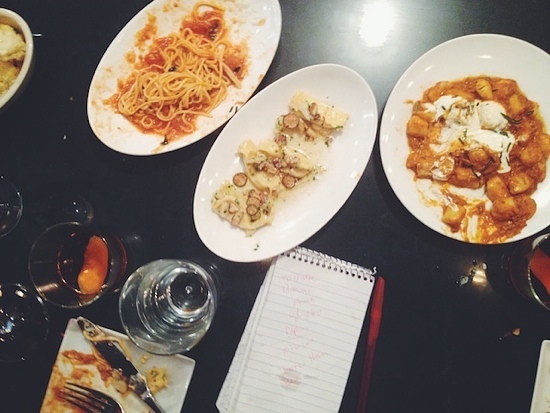 “Graffiato is Italian-inspired, not Italian because we’re not in Italy,” Isabella explains. Hand-rolled pastas are a Graffiato signature, and Isabella appreciates taking the time to get dough right, not cutting corners or modernizing the process: his pizza dough uses a three-year old starter and centuries-old method to achieve a ethereal crispy exactitude in every bite. One of my all-time favorite categories of foods, pasta with funny names, is a prominent feature on the Graffiato menu, including Conchiglie and Gigli, and to a lesser extent, Agnolotti, as in Isabella’s cauliflower filled agnolotti with fried caper berries and marcona almonds, a dish he has in mind for the Richmond menu.